Tip: Looking for a cheap hackeable GPS quadcopter drone, read also our article on Bayangtoys X16. Drones based on free software like most racing quadcopter are inherently easier to modify, repair and customize. But commercial drones such as those from DJI or Yuneec offer advanced features that often do not have an direct open source alternative or would be very dificult to implement. Some examples are gesture recognition or automatic tracking. Wanting to have all those advanced functions it is inevitable to have to buy a drone based on proprietary software. After much reading, I came to the conclusion that the DJI Spark with the “Fly More” pack has the best price-quality ratio, in addition to existing hacks available. Released in May 2017, the DJI Spark was designed to be an affordable consumer drone that is nevertheless capable of producing high-quality images and video. This drone is DJI’s cheapest to date and features a 12-megapixel camera capable of shooting 1080p video at 30fps. The camera is stabilised mechanically by a 2-axis gimbal. The Spark also carries an advanced infrared 3D camera that helps the drone to detect obstacles in front of it, as well as facilitating hand-gesture control—a feature that was, until the release of the Mavic Air in January 2018, unique to the Spark. The flight of the drone in normal use, with the 3D sensors activated, is very slow compared with any race drone or even the open source Phantom alternative the CX-20 on GPS Stable Mode. The good news is that if you try to fly the Spark rigth to a wall or a tree it will detect and brake or dodge it according to the current flight mode. Yes, you can put sport mode which reaches a wooping 50km/h but at cost of the loss of obstacle detection. The flying sensation is great, lots of stability. Flying only with the cell phone does it very well, almost without delay between your finger on the screen and the movement of the drone. However the lag of the received image is important. A video lag that is noticeable (compared to a P4), that is, you press forward, the drone advances almost instantaneously forward, BUT the image of that movement reaches you more late to your cellphone. The duration of the flight is about 12 minutes, down to 10% remaining battery. Using it alternating sport mode and normal position mode. 12 minutes will seem a lot to those from flying racing quadcopters background as they usually fly for 5 or 6 minutes but little to those who come from the older DJI P3 or P4 that works almost half an hour on one battery. Some “range specs” say 2 km, just to hook buyers. The 2km limit is in the US with the FCC WiFi regulations that get the maximum power from the remote, but rest of world and Europe have the CE power limit, which is about 500m away at most. There are hacks to activate FCC mode, more below. The quality of the camera, interesting point, because taking pictures and comparing it with the camera of the normal DJI Phantom 4, SPARK is better. But DJI Go provides almost no camera options, comparing it with the P4, ie, no selection of sharpness, vividness of color, nothing at all. Only white balance, the iso, and little else. The video is very good. There are 4 modes automatic professional video shot mode to choose from Rocket ( Ascend with the camera pointing downward), Dronie ( This is one of my favourite features. The Spark flies backward and upward with the camera locked on your subject), Circle ( This mode lets you make circles around a target of your choice) and Helix (This mode lets you fly in a spiral around a target of your choice). This is the kind of functions you would never find in an open source drone. After my experience some tips on buying the DJI Spark and how to get the most out of it. How many batteries do I need? I would say that 4. We are lucky that they are not as expensive as those of Phantom 4, almost same price as a generic race quadcopter Li-po, so we can gradually buy several. The drone can be loaded with a powerbank in the middle of the field, if you use a normal one that you know will take 140 minutes and will eat from your powerbank. If you have a powerbank that supports fast charge ( Quickcharge 2.0 or 3.0) the drone will detect and charge at 12V instead of 5V and it will take about an hour to load. The “Spark Fly more” pack offers additionally an extra battery, a multiple charger, a transport bag and a physical remote control. It’s cheaper than buying the set separately. The battery is very useful to extend the original 15 to 30, and be able to charge up to 3 batteries at a time is very desirable. Also with the remote control you get a greater range and flight safety (in my tests the DJI Go application was hung once, but I could keep flying with the remote). 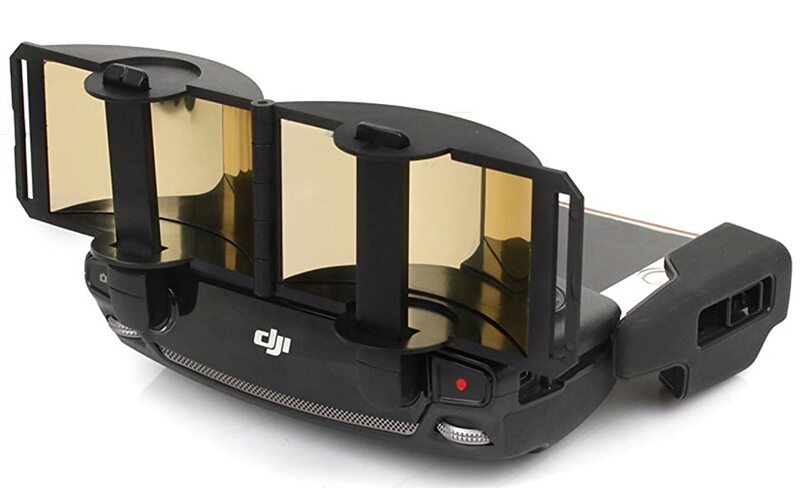 If you want to save as much as possible you can buy your DJI Fly more (RTF option) pack directly from China in retailers like Gearbest, the differences in price with the local market can be huge in the European countries or in the USA. The flymore pack can cost you the same as just the Spark drone in a shopping center in your home city. Achieving more range is, understandably, very important for any drone pilot. One of the easiest ways is to use antenna reflectors to increase the power of the signal. You can find them under 10 dollars on Gearbest or make it yourself. Those devices work! In an area where the DJI Spark barely reached 700 meters distance (FCC Mode, more on this below) with this amplifier I managed to reach over 1500 meters and more in some cases. BEWARE: Actually DJI remote reflectors does not amplify the signal, but change the emission of omnidirectional waves of the control into directional, the accessory bounces them and throws them all to the front of the control in a focused way, giving more strength to the signal … But you must always have the parabolic antennas pointing towards the Drone (to guide you can use the RADAR mode of the DJI Go4 application). The other way to improve the range and gain additional features is the use of modified applications. There are alternative control APPs, either the Deejayeye Hack project of modding the original application to allow the change from EU to FCC (get more range), does not require internet or online account of DJI and in the last versions allows to unlock the restriction of NFZ flight (No fly zone). Deejayeeye it is an open source project that patches the original application. Or you cound follow this tutorial and download ready to use android APKs. The other alternative App is the Litchi (android commercial application), which adds advanced features and functions not available in DJI Go App. The famous “OTG hack”: this simply connect the RC remote to the cellphone with an OTG mini cable at both ends. In this way streaming video comes by cable from the remote without the need for Wi-Fi. In fact to make sure it works we will have to disable wifi on our mobile. With this cable the lag is reduced by 100ms and the signal stability is improved which is impressive for something that costs 1 USD on ebay. The “OTG hack” is called that because it is not a functionality officially supported by DJI. It existed in the old versions because it was left there by the developers. In fact in the most modern versions of firmware and DJI Go this function is disabled. If you want to use it you should downgrade, the recommended combination for OTG is DJI Go 4.1.15 with Sparks FW to 01.00.0600. To downgrade Spark you can use the DJI Assistant 2 PC tool. Older DJI Go versions can be found at APK Mirror or download 4.1.15 MOD2 from Mavic Pilots Forum. This DJI quadcopter has a lot of software and hardware mods. Especially interesting is third-party accessories 3D printed parts will be compatible: camera mounts protectos, landing gear or RC sticks protectors. The price you pay for the things you get in the DJI Spark is very, very good. Flying with the Spark is very easy too so if you are a novice this is one entry level drone that you can learn to fly in just a few minutes. The palm control and Auto modes are just amazing. Also you are looking for a compact drone to carry with you on your vacations to get some amazing videos and photos there is no doubt that this is the right choice because it can fit in any small backpack. Finally it is important to note that the hacks mentioned in this article should never be used to exceed the legal limits of distance and height. They should only be used to guarantee the highest signal stability for flying safety purposes.